Juno, written by Diablo Cody, sees a teenage girl fall pregnant and decide to give the baby up for adoption rather than have an abortion. With the support of her friends and family, she navigates the challenges of pregnancy and the impending knowledge that she will be giving up her child. The film quickly became a cult classic and it's easy to see why. With a witty script, brilliant music and a plot that remained light and adorable whilst not overlooking the repercussions of teenage pregnancy, Juno was a fun and sweet delight with a quirky mix of comedy and sincerity. The fantastic cast includes Ellen Page, Allison Janney, Michael Cera and J. K. Simmons. See also: the brilliant 'Tallulah' (which can be found on Netflix). Tallulah reunites actresses Ellen Page and Allison Janney and is written and directed by Sian Heder. 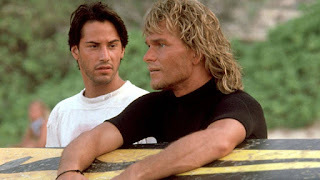 A favourite for many film-fans of my generation, Point Break was one of those films I adored as a teenager (because, hello Patrick Swayze and Keanu Reeves!) and then grew to love even more as I got older and appreciated it for the genius it really is. That this very testosterone-fuelled film is directed by a woman only makes it all the more brilliant, because it's bold and unapologetic and doesn't fit into any kind of pre-conceived notion of what a film directed by a woman is supposed to look like. Reeves and Swayze are a phenomenal pairing on screen, their performances enhanced by the support of Gary Busey, Lori Petty and the rest of the ex-presidents, and the pace never lulls, blending humour with drama and tension. Unlike so many action films of recent years, this film blends the action flawlessly with great characterisation, a plot filled with twists and turns (and some quality one-liners!) and the captivating vision of this very talented director. And there's just enough time left over to throw in a hint of cheese. What better way to kick off the Films Made by Women challenge than with a film written and directed by one who also stars in it! In In A World (2013), Bell plays Carol, the daughter of one of the most celebrated voiceover artists in the business who is trying to break into the industry herself. But far from encouraging her to follow in his footsteps, her father is determined that this is a man's world, a man's industry and he won't have some silly woman coming in and ruining it, least of all his own daughter. There are silly antics along the way, with great one-liners and comedic timing, yet this film is about so much more than silliness. Carol is hard-working, always studying the accents of the people around her and working on improving her own skills, yet she is immediately dismissed by so many people simply for her gender. And when she finally does start to get some success, well . . . you'll just have to watch it and see for yourself. 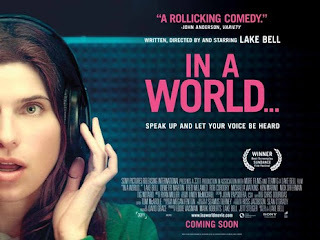 A funny, self-deprecating film about both living in the shadow of someone who doesn't want to give up the limelight and owning your own voice, In A World is a real treat! This is hardly a new thing (see #52FilmsByWomen) but I have set myself a goal to make a conscious effort to see more films either directed or written by women in 2017. While I have thoroughly enjoyed numerous films by male writers and directors, the balance is still off. Of the films I saw at London Film Festival last year, some real standouts were made by women: Amma Asante's A United Kingdom, Mira Nair's Queen of Katwe and Lone Scherfig's Their Finest (written by Gaby Chiappe). Yet, their wider releases (if they were fortunate enough to get one!) came and went without much discussion. So my plan is to watch and discuss them, plain and simple . . . and if I can't find any at the cinema then I have some DVDs to go through (see the photo!) and some options on Netflix. If you feel like joining in or have any suggestions then feel free to tweet me at @filmvsbook. I've grown up aware of gender inequality. I've heard about how difficult it is for female directors and writers to get work. I’ve heard trolls moan about the 'feminazis' pushing their agenda down people's throats every time someone has the audacity to put a female in a lead role in film or TV. But it wasn't until I started scriptwriting myself that I became fascinated by the process that leads up to these stories and how they're told – and the almost ridiculous things we must add to the script in order to improve things. The TV script I've written is full of diversity and has many female roles. The main character is (shock horror!) a woman. Yet I didn’t set out to write a diverse story – it's just the story I wanted to write. It's essential that the cast is a mixed one. When I started to investigate scriptwriting in all its glory, I found advice saying that if you're writing a crowd scene, you should specify that half of the crowd are female and that you should specify that there are numerous ethnicities. Don’t just say 'A soldier enters' or 'A police officer enters'. Purposely make them female and non-white from time to time. Because if you don't then the default of White male is likely to appear in the end product, whether that's how you saw it or not. And it got me thinking about the unconscious rather than the conscious bias. That if you start talking about a doctor, many people might just assume said doctor is a man. Or if you talk about a primary school teacher, the assumption is that she’s cute and wears flowery dresses and glasses. Because people are going to go to their default, whether they mean to or not. But the fun really begins when you go against your default! Before I’d even begun, I realised that telling people you’re doing an unconscious bias test sort of defeats the point a little bit but for me it was more important to make people think about their own default and to question it. And knowing what I was doing forced me to change my own defaults, just to try and make a more interesting story. I started off with my first character: Show: family drama, small, intimate, psychological. Character: creepy neighbour, introvert, no friends, spying on neighbouring children. From that one brief Tweet, the character the voters came up with was: male (88%), 30-50 years' old (50%) and White (a whopping 97%!). And what were the people like on this street? Middle class, according to 79% of the people who responded. I had not said a thing about the street. It could have been a very poor, working class one and there could still have been a creepy neighbour. It could have been the richest street in England and it could still have worked. But middle-class, White and male just seemed to be the go-to. Not a single person thought the neighbour could be Black. And only 3% considered that they'd be Asian. So let's mix things up a bit. Let's imagine that story again. How about we make the neighbour a woman. Imagine that she is perceived as creepy rather than is simply because she doesn't talk to people, when actually she's just very sad. Make her misunderstood, not sinister. She's looking at the children because her own child died, perhaps. She's introverted because she's too sad to go out and talk to people. Or, alternatively, make her elderly! She just looks at the children because she's longing to go back to her misspent youth and hates that she's old. She has no friends because they've all died, and she knows her turn is coming soon and nobody will mourn her. Or maybe she's elderly but still really, really creepy! Let's move the street. Set it in Birmingham, or Leicester, or so many parts of London where 'White' is not the default, where there is a high Asian population, for example. Or make the whole street Asian characters who live in constant fear of the creepy White neighbour who never speaks to any of them. The possibilities are endless. But the point, of course, is that there are possibilities that don't involve a White, middle-class male. You say the story is set in space so where does your head go? Alien? Star Wars? You're probably already imagining your favourite space-age hero/heroine. A leader, possibly a female (thank you, Ripley!). But they're 'freakishly strong' which may suggest that they're male. Because there are strong women but can there be 'freakishly' strong ones? (Of course there can be!) But this 'leader' is crass and of few words. Does this suggest male more than female? So, who did we come up with? Well, despite the first responses leaning heavily towards this character being a female (thanks, possibly, to the Katniss/Rey-effect! ), the final tally made them male (61%), White (50%), with dark hair (53%), ragged/messy in appearance (70%). This time around, the percentages weren't as high but we still ended up with a White male. 25% thought he was Black, while 10% opted for our leader to be Asian. When it came to hair choice, my own bias came into the potential answers. Because when I thought of a surly, crass leader I thought of John McClane. So I added 'non-existent' and 27% of voters agreed. Film: childhood adventure, set in major city. Character: 12 yrs old, lonely, imaginative, funny, sweet. Brave in made up world, not in life. And who did we cast here...? Well our lonely, imaginative, 12-year-old is a girl (91%), White (55%), from a pretty financially stable home (70%) and has dark hair. Unlike our space leader, 20% saw this girl as having her hair dyed a vivid colour (0% considered this a possibility for the spaceman). 27% considered she'd be Black and 18% saw her as Asian. Was this because I'd purposely noted that it was set in a major city? Who can say? What do you make of these results? Did anything surprise you? Mere days before Matt Smith announced his run as the Doctor was coming to an end, I posted a piece on Yahoo asking the question 'Is it time for a female Doctor?'. When the announcement about Smith's departure landed, the piece suddenly made the Yahoo! home page and - well - all hell broke loose. Doctor Who: Is it time for a female Doctor? With Matt Smith to leave his role as the Doctor at the end of this year, has Alex Kingston's River Song paved the way for a new female Doctor? There have now been eleven Doctors in 'Doctor Who'. That's eleven Timelords played by eleven men through eleven regenerations. The long-term assistants - though there have of course been men from time to time - have tended to be female. This male Doctor/female assistant dynamic has been the one constant for the cult TV show but in the fifty years since the show began, the roles of men and women have changed in our society. Why, then, have they not changed in the show? The most recent series have certainly created more 'equal' females for the Doctor, with many of these mere humans risking life and limb and proving to be smart, courageous and always so incredibly loyal. 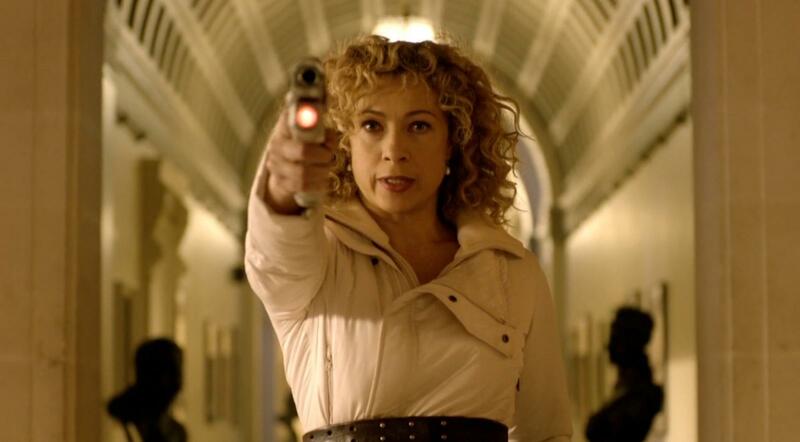 None has been more equal, though, than River Song. Thanks to Alex Kingston's hilarious, dramatic and often heartbreaking portrayal of the character, a time-travelling, regenerating female is no longer an item of speculation but a reality much loved by fans. River Song knows how to fly the TARDIS, how to hold her own against an alien race (and more often than not - the human race) and has given audiences just as much fun, emotion, excitement and adventure as any male Doctor. Surely then, now that Matt Smith is leaving the show it's time for the Doctor to regenerate into a woman. After all, his eleventh Doctor initially thought he might be a woman when, having just regenerated, he touched his slightly long hair and cried 'I'm a girl!'. Imagine the hilarity if a new, female Doctor were to be reunited with her wife, River Song! What would Captain Jack make of a woman Doctor? Or Vastra and Jenny? Strax, of course, wouldn't notice a difference. Add to this a male assistant in need of excitement and escape, as they so often are, and there's surely a brilliant pairing ready to provide yet more TV gold. 'Doctor Who' is a show about regenerating - not just the Doctor himself, but the alien worlds, the enemies, the assistants and the special effects. Before it can become tired, the show needs - quite literally - a face lift. Time may be a big ball of wibbly-wobbly timey-wimey stuff but isn't it time we got a female Doctor in the TARDIS? With another man cast as the Doctor, why are fans so reluctant to see a woman take on the role? Why the vitriolic reaction to the question ‘Is it time for a female Doctor?’ made the announcement of Peter Capaldi’s casting in the role so disappointing. Around the time Matt Smith announced he was to leave ‘Doctor Who’, an article I had written about the show – in which I asked whether it was time for a female Doctor – proved to be quite the topic for debate. Some were in agreement and others, unsurprisingly, were adamant that the role should not be played by a woman. It seemed that, with the fiftieth anniversary approaching, something big was coming. Alex Kingston’s character Dr River Song had proven immensely popular, the Doctor had accidentally created a daughter with two hearts and audiences were taking to the idea of a woman who could regenerate. Looking back over the last fifty years, the continuing success of the show, the concept of regeneration and the constant shift in dynamic between Doctor and companion, it seemed to me that perhaps now was the moment for a change. I didn’t just want a woman to take on the role. I wanted a male companion to go along with her. Or perhaps a Doctor of colour. Just something different. I expected passionate, enthusiastic responses on both sides of the debate. This is ‘Doctor Who’ after all. However, I was stunned by the sheer level of hatred and vitriol that appeared when the article went live. Some readers – both male and female – chose to attack me for having written the article, assuming incorrectly that I wanted the next Doctor to be a woman simply because I was one and must therefore have been forcing my feminist agenda down their throats. As if women could have a valid opinion. What was I thinking? Some even had the courtesy to address me directly, with one commenting, ‘why do you PC brigade ever get to air these stupid, spoiling views, just enjoy what you have’ and another discarding the article entirely it seems because ‘Surprise surprise the article is by a woman.’ Had a man written the exact same article, would it have been more valid? Others took the suggestion to ridiculous lengths, asking why we didn’t just make the new Doctor ‘a blind, disabled, half black, half chinese, transexual’ or ‘a lesbian while you're at it; maybe with a ladyboy as an assistant!’. Then there were those who simply wanted to air their sexist views, with many foreseeing the end of the show because ‘She'd never be out the tardis for changing her makeup’. One speculated: ‘can you imagine the doctor with PMS god help the universe’. Those behind the show then announced that Clara would be staying and I went right off the idea of a female Doctor. The show has broken so many boundaries already but I feared that casting female actresses in both the lead roles would be too much for many fans, myself included. Throughout this entire process, I always had complete faith in Steven Moffat. It felt to me like he would be open to the idea of change but wouldn’t bow to public pressure and, in the end, would opt for whoever he felt would do the best job. So at the moment Peter Capaldi was announced as the new Doctor I was excitedly watching the BBC along with so many other fans across the world – and I do think he will be brilliant. But seeing that typical white male walk out made my heart sink a little. It must be my feminine hormones acting up again. They do that from time to time. 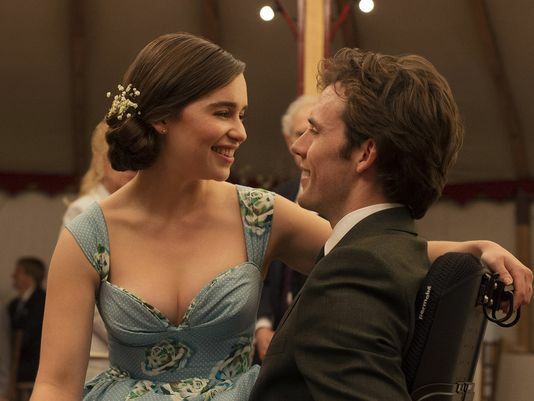 Me Before You was such a successful novel that when it was announced that an adaptation was in the works, fans of the book were caught between hesitation and excitement. 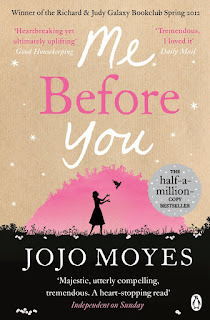 Even when the book's author, Jojo Moyes, was announced as the screenwriter, there were doubts. Because, when a book is that loved, you don't want it messed with. Fortunately, Moyes has proven with this screenplay that she is not just a brilliant novelist but also a great screenwriter, with a spot-on understanding of what works on screen and how to compact her story successfully into a feature film. If it wasn't integral to the story then it wasn't included in the film. Did Will need to have a sister in order for us to appreciate the issues faced by his family? No. We had his parents for that. Do we need the tension at Lou's house, the sibling rivalry and animosity, or the claustrophobic nature of her home in order to appreciate the family? No. They can be packed into the small house and still be loving and supportive. Though there are some minor character traits and side plots which are forgotten, the major one that may surprise fans of the book is the total absence of a particular maze and all the events which took place. Now it might seem like a whopping great omission but having revisited the story I can see why it was left out. There is no question that this was of huge importance in the book. It explains Lou and it allows Will to be the one who makes her face up this key moment in her life and start to move forward from it. Yet in the film there simply isn't time. Other elements would needed to have been cut in order to properly go into what happened in that maze or else it would have been thrown in almost as an afterthought. Either option just didn't seem to work. Moyes herself even tweeted a fan, explaining that they tried to fit it in but just couldn't figure out a way to do it properly. The people are still going in the same direction. We're just spared some of the specifics. The casting is so impressive. Very unlike her Khaleesi role, Emilia Clarke IS Lou. She's cute and adorable and chatty and a little bit bonkers – in the best kind of way. Sam Claflin similarly takes on Will, an extremely complex character, with apparent ease. The supporting cast, from Janet McTeer to Charles Dance, are all equally awesome to watch. And this brilliant ensemble are guided through the story by director Thea Sharrock, who displays the same genius command of storytelling as Moyes. The whole team have really come together here to tell this much beloved story. It's a delight to see that, after some authors who probably should have been consulted on their adaptations and weren't (and some who shouldn't have but were! ), authors are finally being acknowledged for their talents, not ignored. We are in a new era now when authors of great books are afforded not just the courtesy of being consulted on the adaptations of their own stories but the opportunity to write the script themselves. 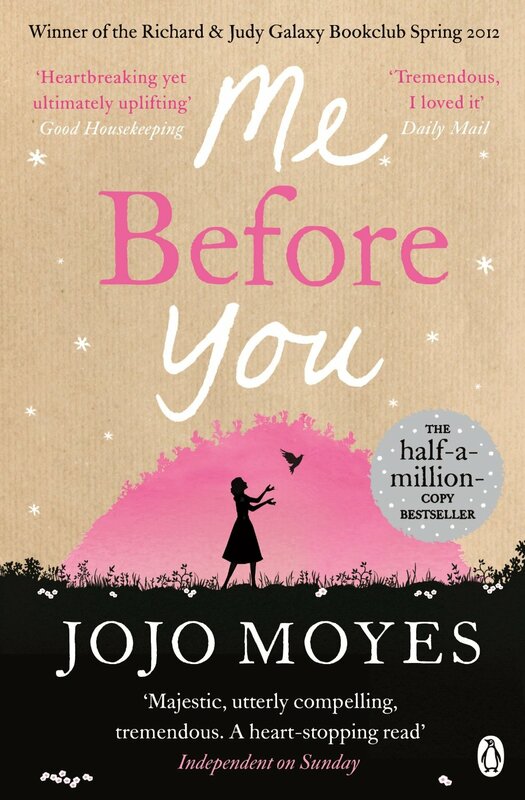 Gillian Flynn did it with Gone Girl, Emma Donoghue did it with Room, and now Jojo Moyes has done a phenomenal job with Me Before You. So get your bumble bee tights on and go and see this absolute treasure. Then go home and re-read the book! © Amanda Keats 2011-2015. Picture Window theme. Powered by Blogger.